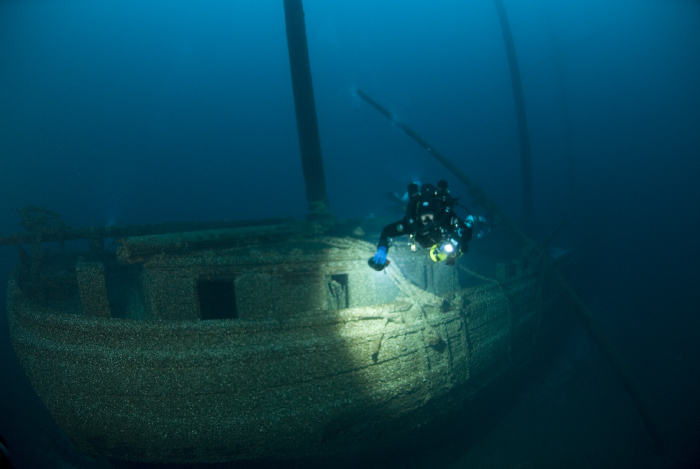 Windiate was a three-masted schooner with the dimensions designed to fit into the locks of second Welland canal  she was just 136 ft long and 26 ft wide. 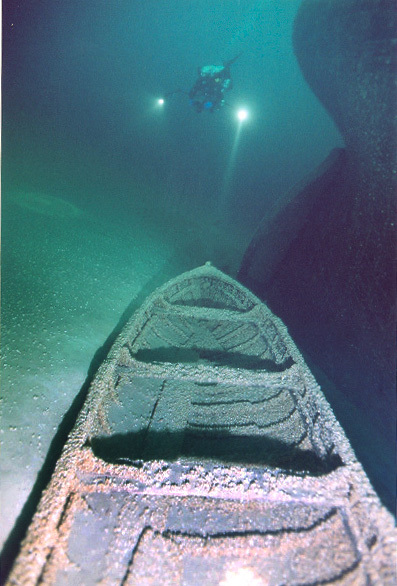 She was only 2 years old when she failed to make an appearance at her final destination on her last run of the season between Chicago and Buffalo and was given up for lost. 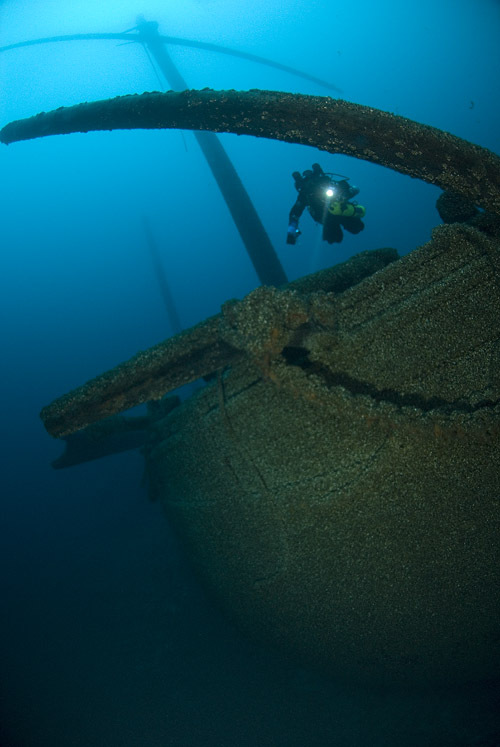 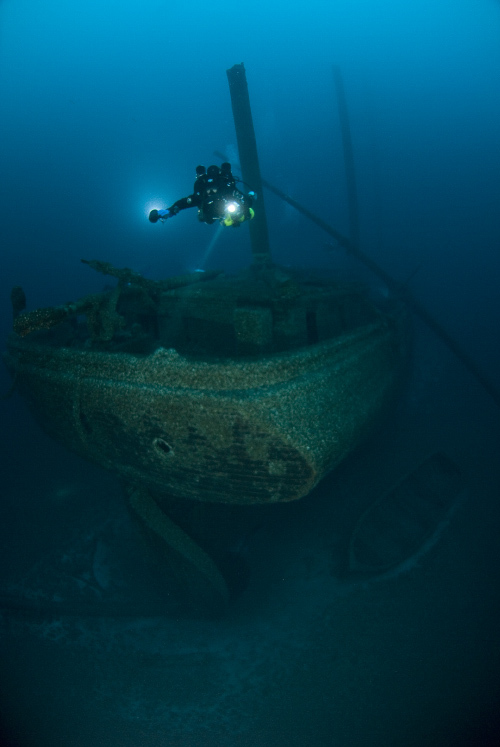 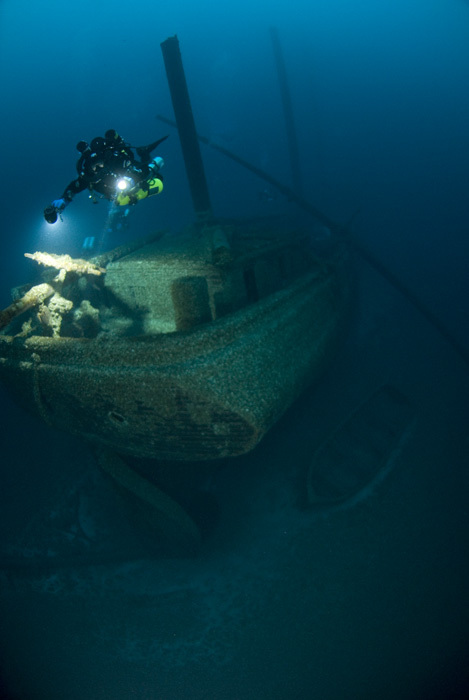 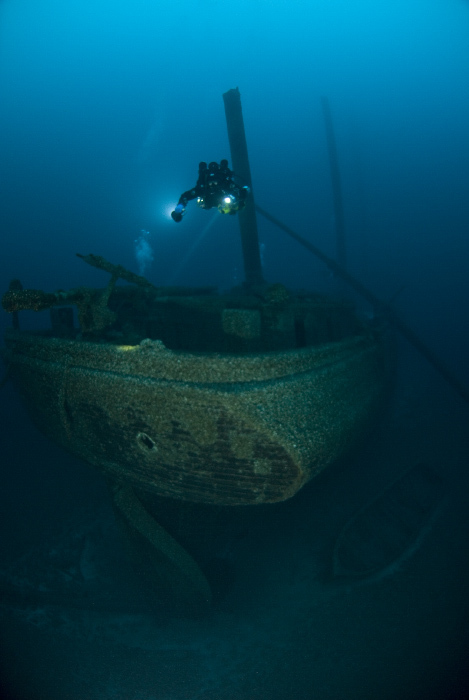 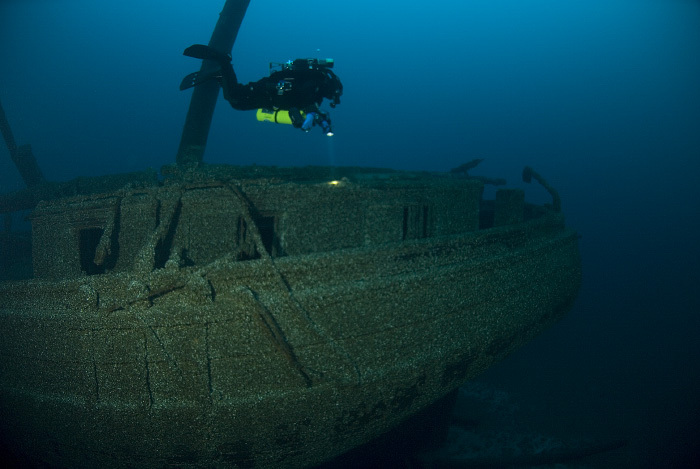 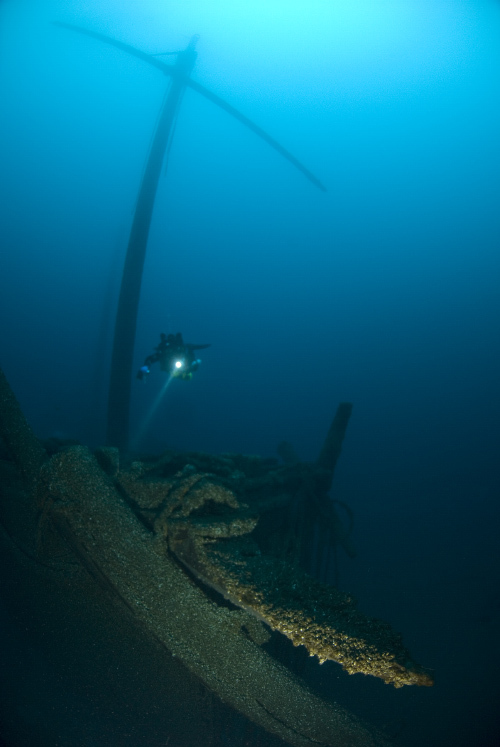 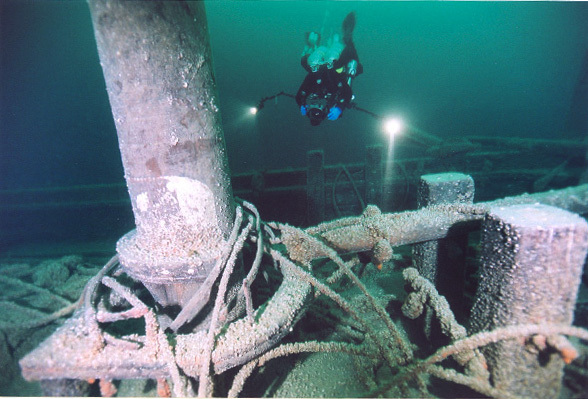 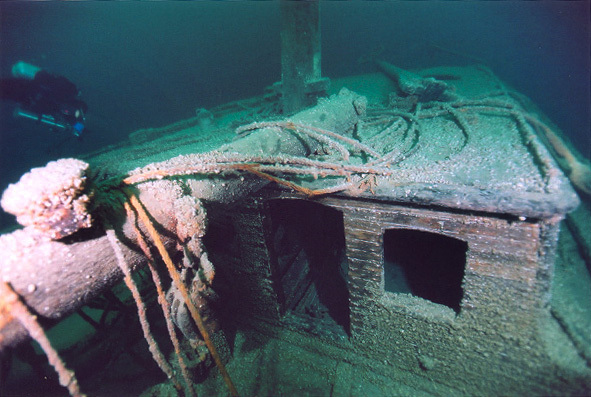 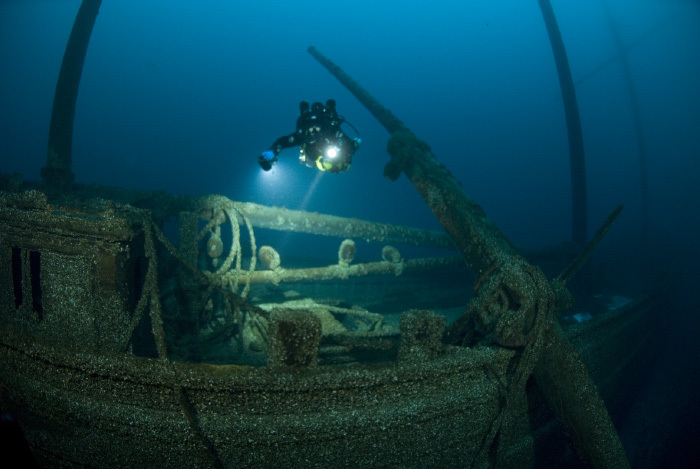 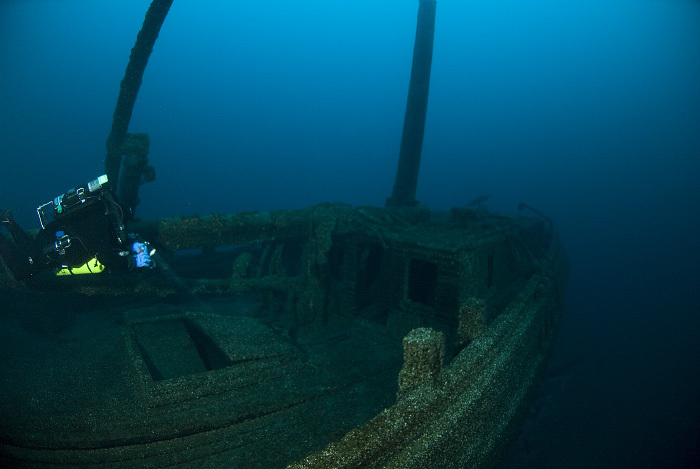 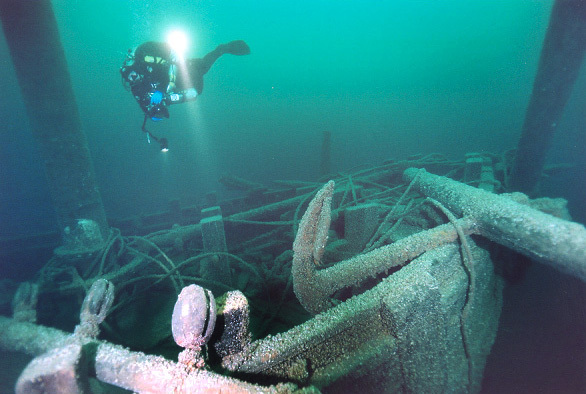 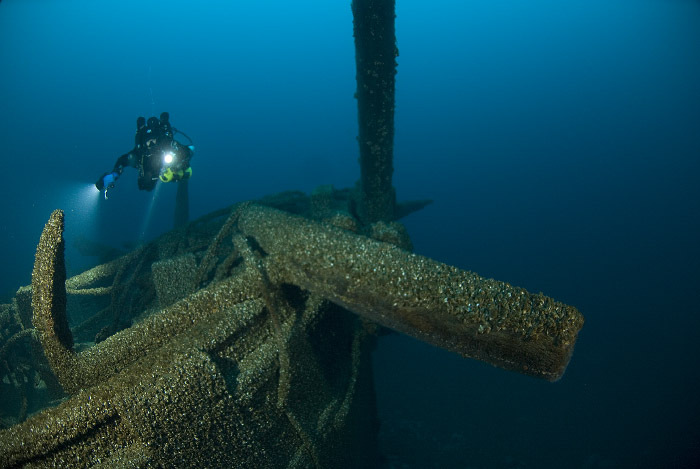 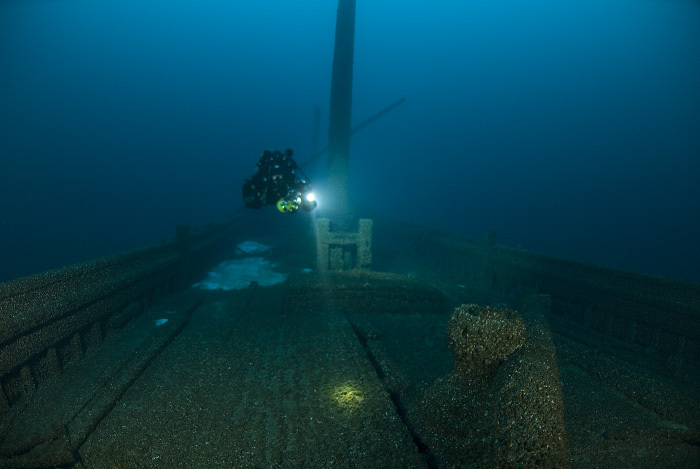 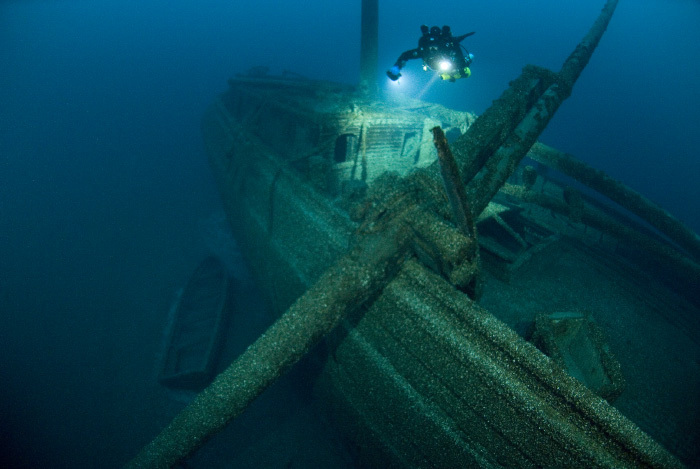 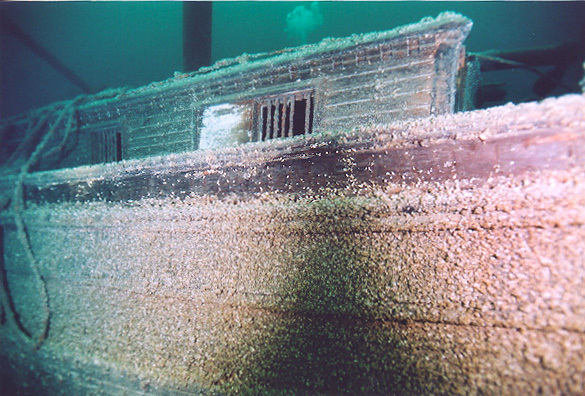 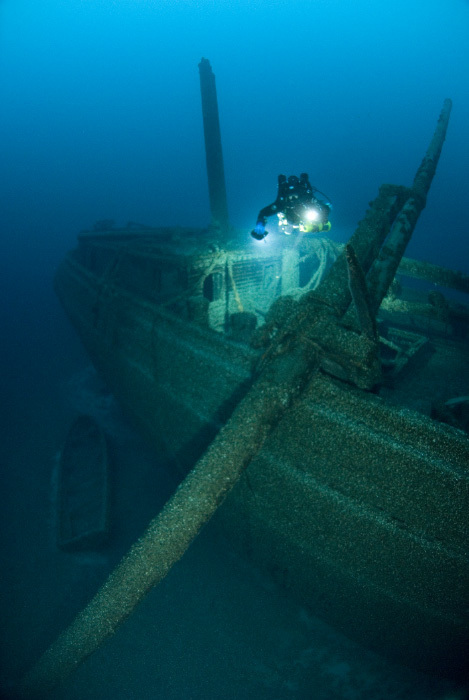 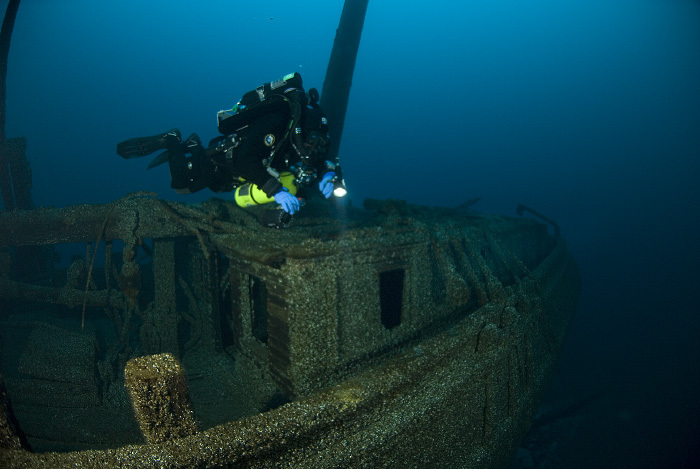 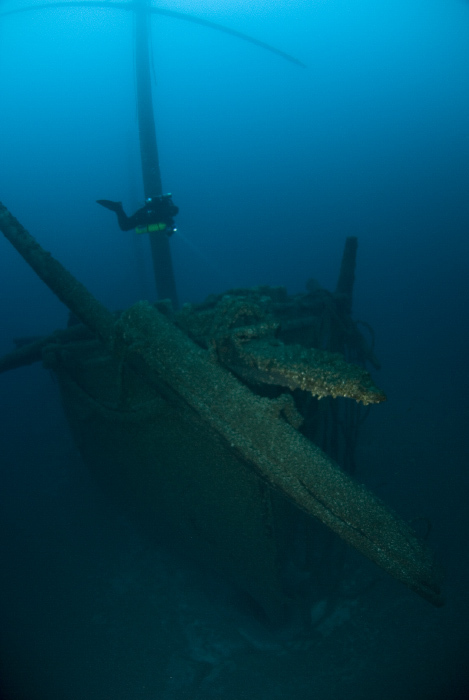 Since no records existed of Windiate passing through the Straits of Mackinac, she was thought to be lost in Lake Michigan for almost 100 years until she was discovered in almost 200 ft of water in Lake Hurons famous schooner valley stretching few miles offshore between Rogers City and Alpena, Michigan. 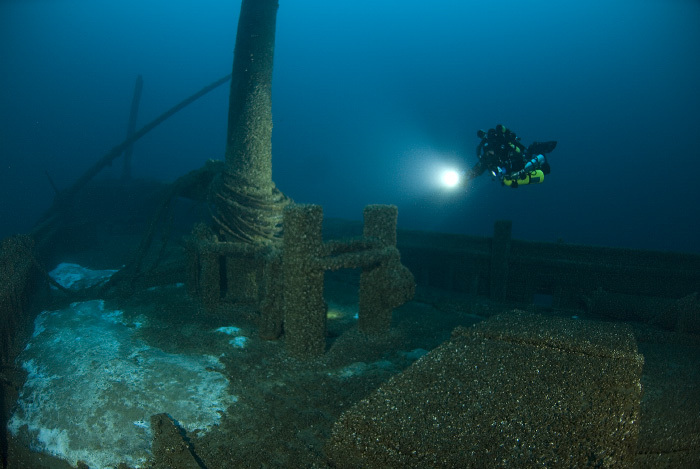 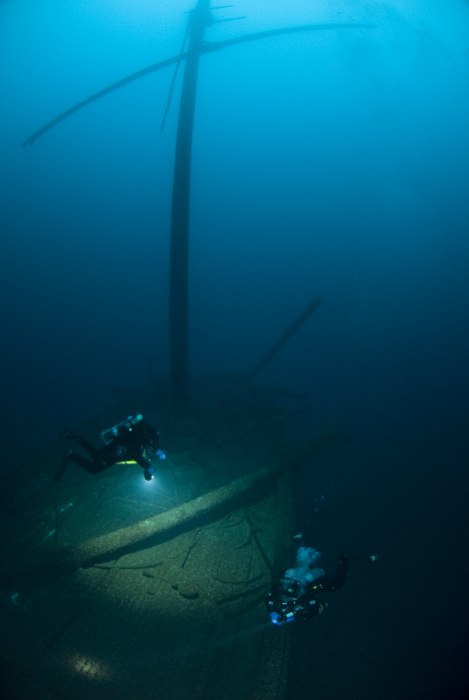 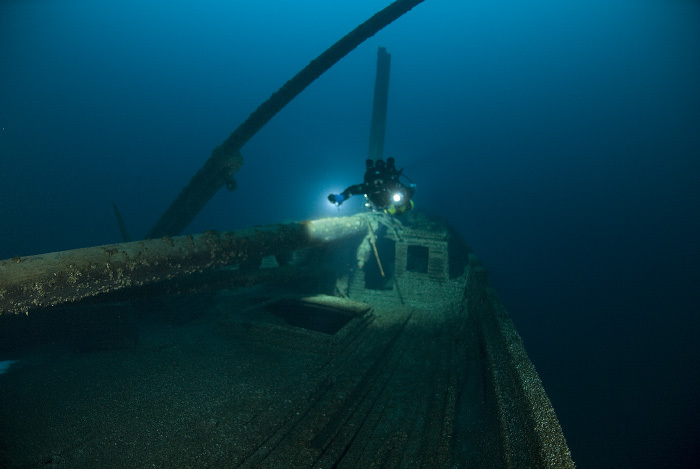 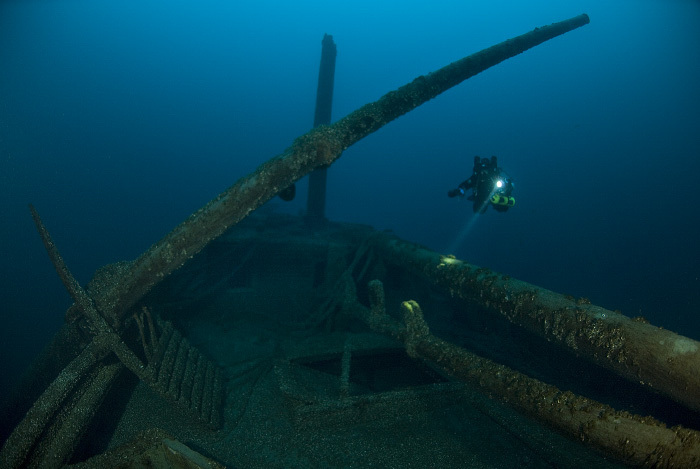 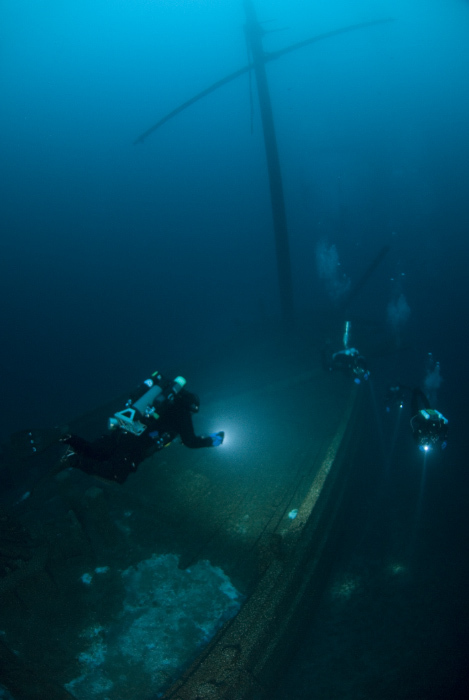 On an exceptional visibility day, a visiting diver might see all 3 masts and most of the wreck. 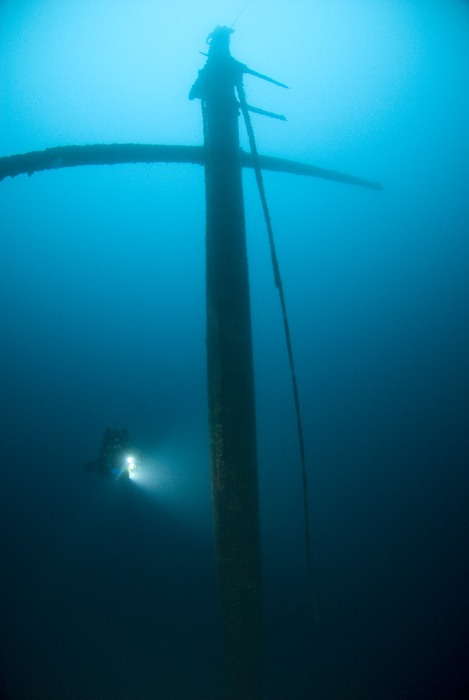 June 7, 2008 was such day. 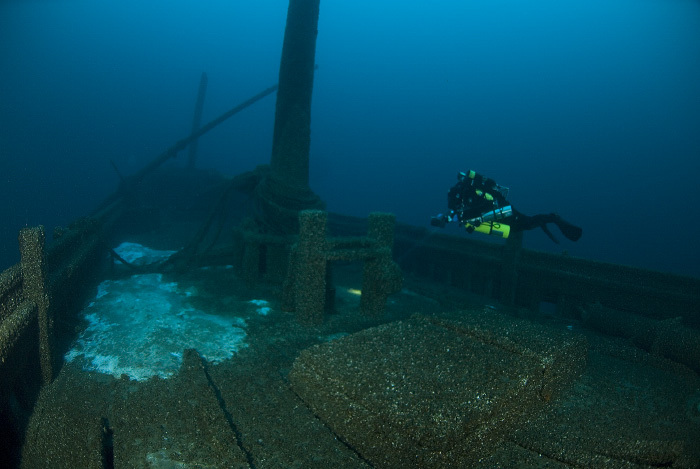 First shot shows 3 masts visible from amidships vantage point and second shot is from the stern. 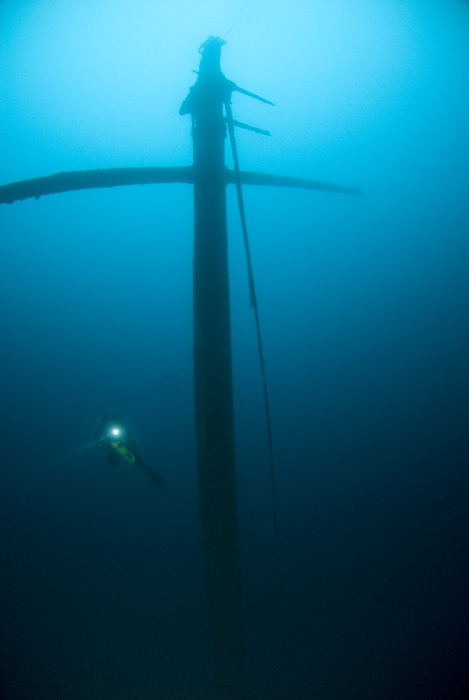 Forward mast and cross tree are barely visible as faint silhuette. 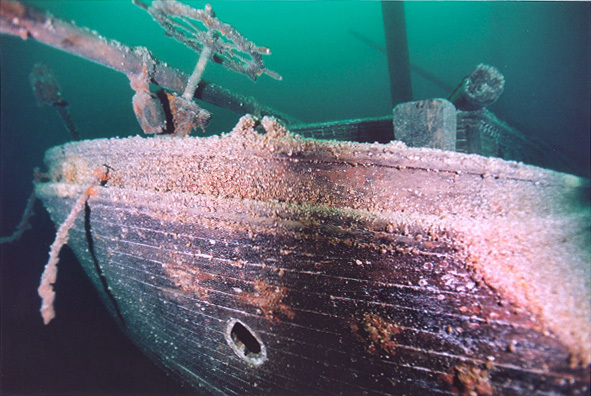 The last shot also shows the lifeboat off the starboard side. 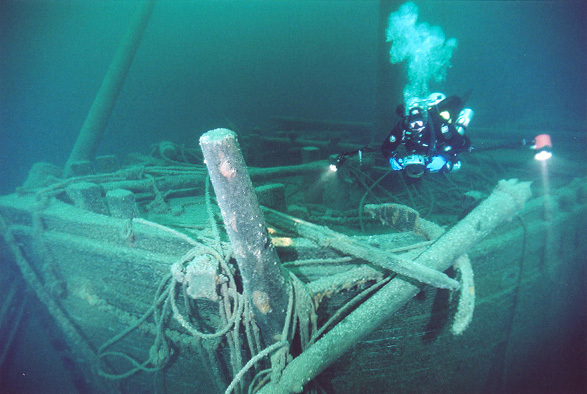 The bowsprit is broken right at the point where it was attached to the bow, likely during sinking, and that is pretty much the only part of the wreck that is not pristinely intact. 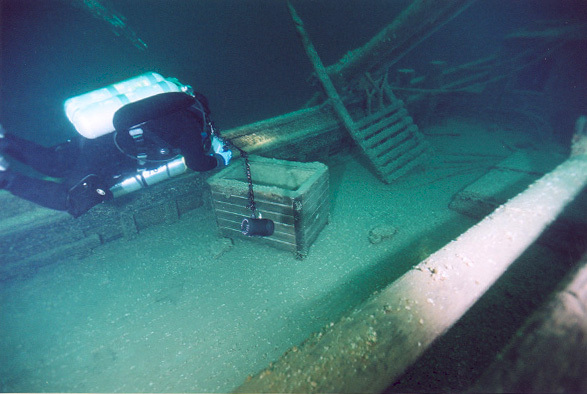 Both large wood-stocked anchors are still resting in their stowing places. 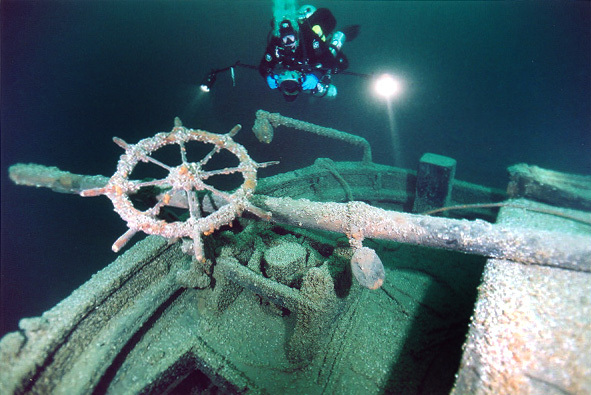 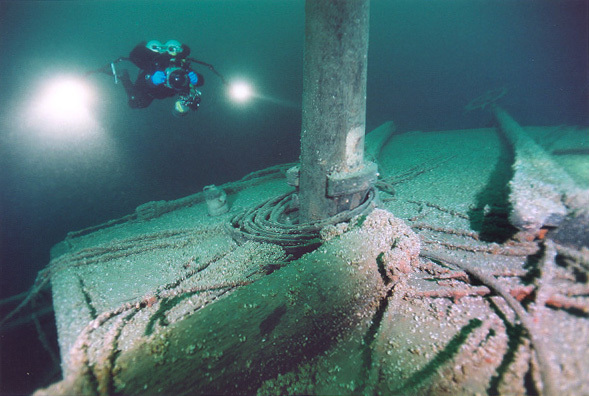 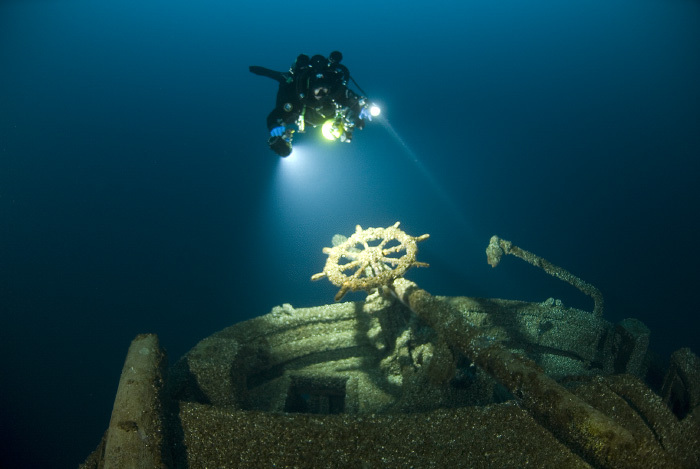 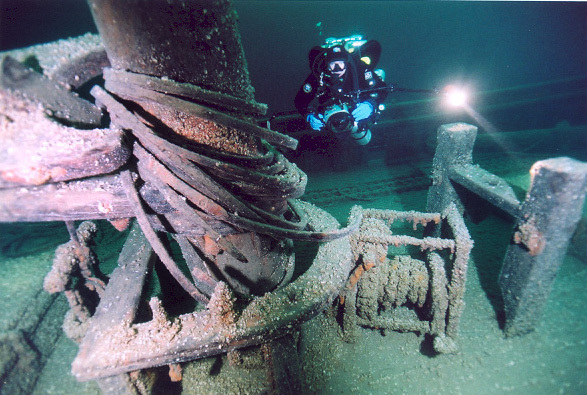 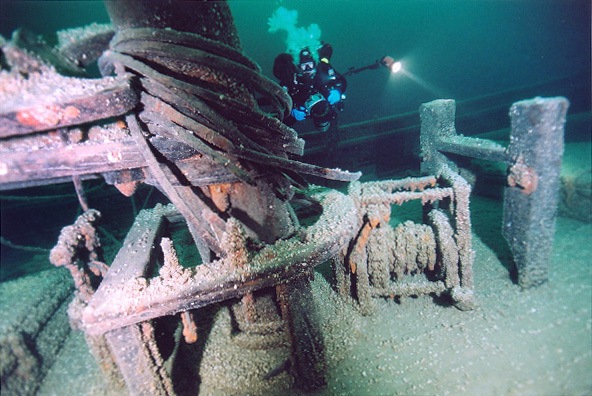 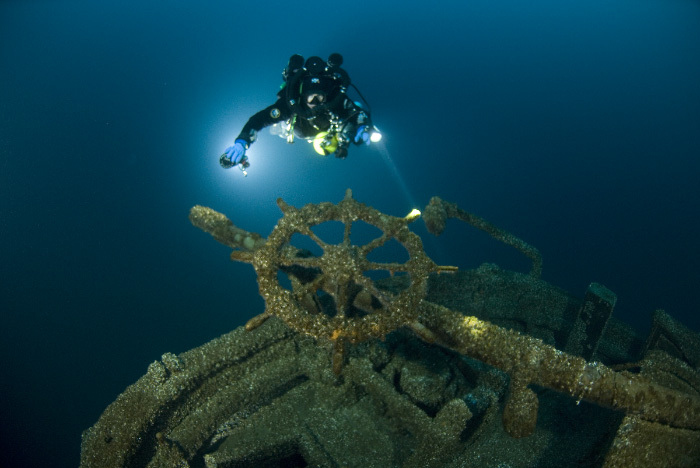 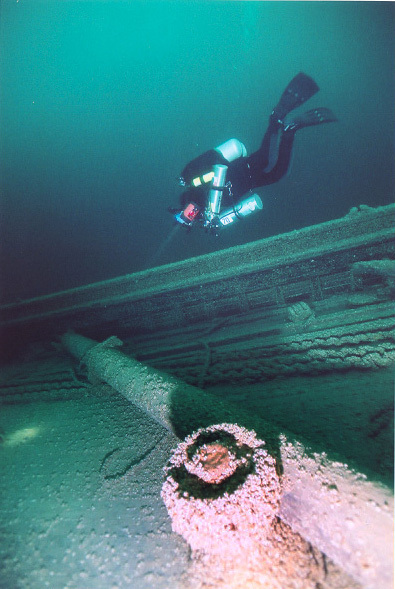 Interestingly, there is a chain that is attached to the windlass, but then runs alongside the wreck in couple long loops  was that a standard operating procedure before deploying the anchors? 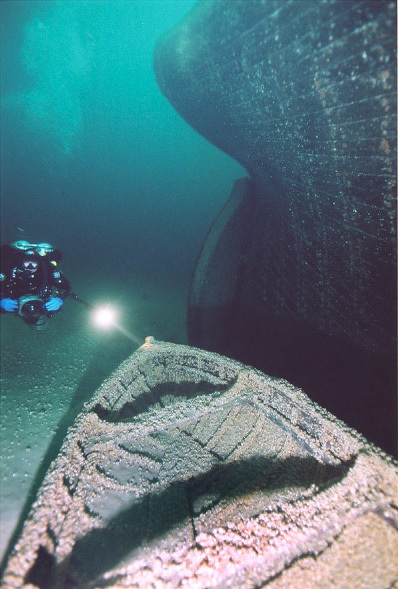 Windiate carried cargo of wheat on her final voyage, but the cargo is hard to see since all cargo openings are still covered by intact hatch covers. 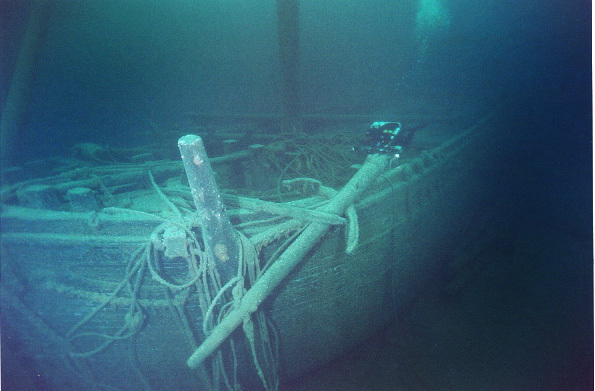 The tops of the masts, the cross trees for main and mizzen mast lay all over the deck. 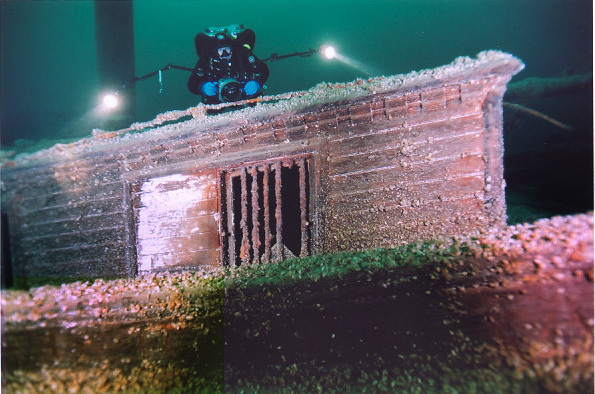 The intact railing runs along both sides of the ship with deadeyes and various blocks still in place. 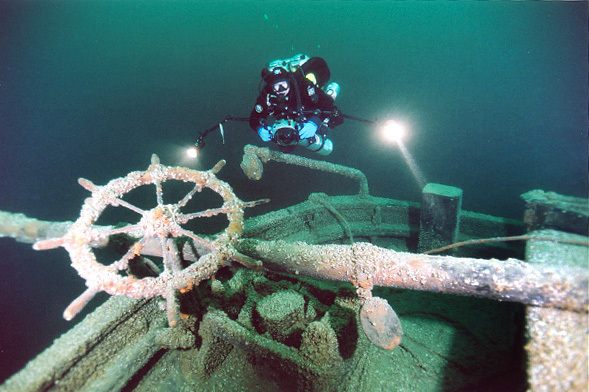 At the stern, the steering mechanism was tilted severely resulting in the wheel being almost horizontal to the deck level.